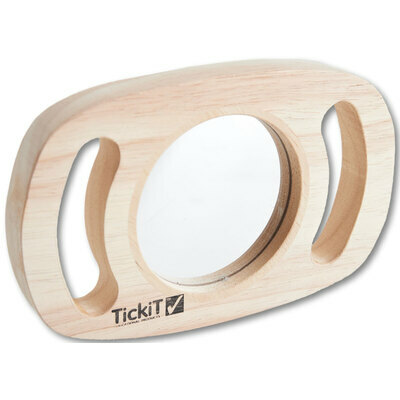 Making for an engaging addition to your sensory collection, our Easy Hold Wooden Mirror is a durable and educational tool. Made from a strong rubberwood, this easy-grip mirror features two side handles designed for younger hands and a round mirror at the centre. Use to teach the younger children in your class about the fascinating world of reflections and watch as their eyes light up at the reflection of themselves peering back out. Suitable for use in collaborative play as well as self-exploration, this wooden mirror is suitable for use by children over the age of 1. Here at Gompels, we also stock our easy-grip wooden mirror in a Magnifier, Coloured Panels and a Convex/Concave Mirror to create an imaginative world for younger children.